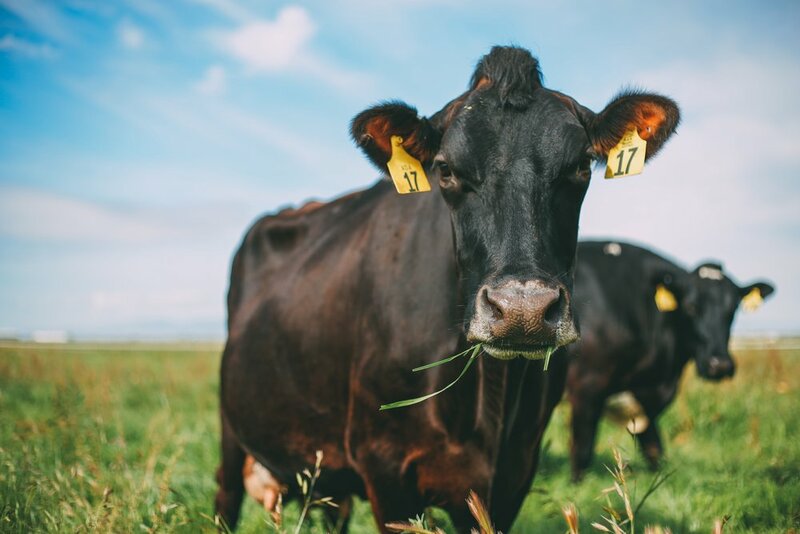 Here at Organic Pastures Dairy, we feel like each cow is like our personal pet. It is only fitting since our family lives here on the farm! “Hey Miss Ada,” says Blaine McAfee (Herd Health Manager and one of the owners) pretty much each and every single time she spots Ada out on her daily walkarounds in the pasture. To be even more honest, Miss Ada is probably called Miss Ada-May-Roo-Girl (or something to that note) because Blaine is known for her #extra personalized names. Sound familiar? Do you have a pet named Pete, but you actually have about a dozen #extra names to go with his name? Why treat our herd-like pets? It is just how we have always done things differently here on the farm. They are too cute not to love a little #extra! Whole Raw Milk is mother nature's most perfect creation. It is balanced, nutrient dense, and it comes from the most majestic mammals on the planet. You will be greeted by a herd of curious and kind grass-grazing beauties when walking around our organic farm. Giving a cow their name is very fun. At Organic Pastures, we give our cows their name when they are about 1 year old. After the cow is old enough to show us their true personality, we pick the most suitable name. In some cases, our cows are given names that are spot on! Other times, we miss the mark. Our most notable missed mark when naming a cow was Mousey. Mousey was shy and very, very stand-offish. Well, this changed because Mousey evolved to be our MOST outgoing cow. So much so, she became Mark McAfee (CEO and Founding Owner) personal pet-favorite cow. When Mark would be interviewed by media or give a tour in the pastures, Mousey would run clear across the field to go show her love. What Does It Look Like to Show Love (When You Are a Cow)? In Mousey’s case, she would start by saying hello (moo, moo). After a few seconds of smelling and sniffing, Mousey would start going-to-town on rubbing your leg, arm, anything. You better have a strong stance because Mousey LOOOOOVEDDDDD to rub. If you had the time, Mousey would rub you for half of an hour. She would cover your body in cow hair, snot, dust, but mostly love. On most days, you loved this sign of affection, but on other (more formal days) you knew to stay CLEAR from Mousey. One time our family was taking pictures in the pasture (see picture below) and the hired photographer didn’t know about Mousey’s affectionate side. The photographer’s leg became a rubbing post while she was also trying to capture family smiles and hugs. Priceless. What Is the Dairy Industry Standard? On a typical farm, a standard number or microchip is given to their herd to help identify. When we established the farm in 1999, we felt compelled to give a personal touch. The first herd that arrived on our organic farm was quickly named that very same day! Blaine and her daughter Kaleigh stood with a clipboard overlooking the cows shouting out, “Cow number 445, name her Cher because she has curly hair for days!” Each cow was named based off of their looks, personality, and spots. Over time, the family named the cows after loved ones and iconic cities. Over the past two (2) decades, our family and team asked the customers to get involved. Many cows are dedicated to special customer-chosen names. Whether dedicated over a passed family member, new born child, or favorite pet look-alike, our team has proudly shared this loving responsibility of naming. Do You Want To Name A Cow? If you would like to submit your name to be considered, then we would love to have you leave a comment below. If you feel compelled to share the meaning behind the name, then we would love to read in your comment section about the story.